Most of the posts I write are optimistic and upbeat. Not this one. I have just come from an excellent breakfast hosted by Qualcomm where we had half a dozen talks about the future for mobile. We heard about the potential for NFC, augmented reality, mobile commerce, and mobile operating systems, but the presentation that really caught my eye was about the growth in mobile malware. We heard that the number of new mobile malware threats identified in December 2011 was equal to the total number of threats ever identified through the end of 2010. A quick web search found many other people saying the same thing, including ZDNet who recently produced the chart below. 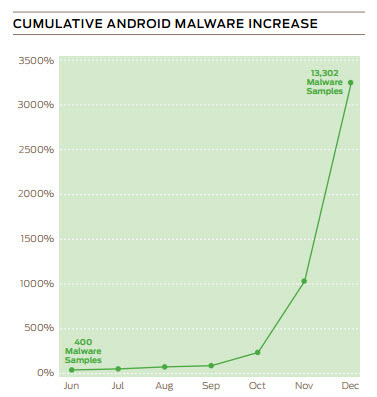 In short, mobile malware threats are growing almost unbelievably fast. They are not yet a fact of life for many, and I can’t recall anyone I know suffering from an infected phone, but at these growth rates it won’t be long before we have all experienced an attack. Unless your phone is an iPhone that is. Kaspersky has only ever found two iOS threats and they were in 2011, and they targeted jailbroken phones. Android users are far and away the most vulnerable, due to the open-ness of the system and the large numbers of devices that cyber criminals can target. If you are going to build a virus you might as well build it on the platform that offers the most potential victims. The reason I’m posting this is that when something grows as fast as this I take notice. Rapid change creates opportunity. I’m not sure how this one will play out, but as a consumer I want to protect myself, and as an investor I want to understand who will profit from it.